Today's buyers are engaging sales professionals much later in the buying process, but 74 percent of deals go to the sales professional who was first to engage the buyer and provide helpful insight. In this session, Jamie Shanks will speak about how personal relationships can be used to build revenue and master the methods today's business demands. In this session you will learn how to: (1) Reach and engage buyers online, (2) Provide value and insight into the buying process, (3) Some of the most effective Social Selling tactics, and (4) Develop the relationships that lead to sales. According to research conducted by Forrester, over 1 million B2B salespeople in the US will be obsolete by 2020. In addition to this, only one of the four salesperson archetypes will survive the digital shift that we are experiencing. Which seller archetype are you? How are you going to reboot your sales force? What are you doing to ensure that future sales hires have the skills that are essential for them to adapt to the modern buyer's journey? Join Jamie Shanks (Sales for Life) for this value packed webinar that discusses the reality of the modern buyer and how B2B sales teams need to develop new skills and strategies to align with this new journey. Forbes have found that 78% of salespeople using social media perform better than their peers. But how do you ultimately report on pipeline and ROI from Social Selling? Can you measure Social Selling tactics using your existing CRM? 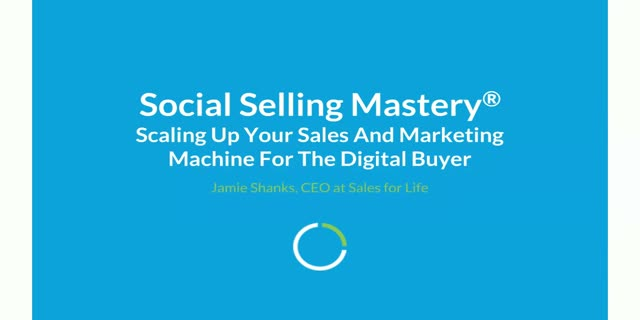 In this session, Social Selling leader Jamie Shanks will discuss best practices for tracking and measuring the impact of Social Selling. From gathering leads to nurturing them and moving them through your sales funnel, this value-packed session will help you start incorporating a solid measurement strategy to prove the results of your Social Selling tactics. While many companies are realizing the value of social media for demand generation, not many companies are using social effectively to generate qualified leads. In this session Amar Sheth, VP Customer Success at Social Selling experts - Sales for Life, will discuss a number of actionable tactics that your team can use to generate leads through social and digital means. Social Selling can help accelerate every stage of your existing sales process. However, many companies struggle to see exactly how these tactics can be applied throughout this process, especially at the early stages of the funnel. From lead generation to prospect nurturing and closing deals, this session will cover strategic insights that are currently implemented by organizations around the world. The main goal is to help you start understanding how you can fit Social Selling into a daily sales routine.